As a holistic health coach, personal trainer, and Pilates instructor, I coach clients on creating meaningful health and fitness goals to optimize their energy and to find peace in their body and mind through personal and small group consultation. My passion for health and fitness traces back to the 1980s as a young girl jumping along to Jane Fonda videos and begging my mom to wear the gray Flashdance sweatshirt with the cut off neck. From these fashionable beginnings, I focused my energy on performance and the theatrical arts and received a bachelor’s degree from Roger Williams University, all the while taking an aerobics class whenever my schedule allowed. After receiving my master’s degree in communications management from Simmons College, I decided to continue to feed my desire to learn and enrolled in a Pilates teacher training program through Balanced Body. Pilates had become part of my fitness regime upon the advice of a sports nutritionist after having issues training for a half marathon. I was sold; on Pilates and on the idea of helping others with concerns related to health and fitness. 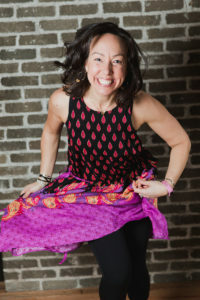 I immersed myself in this world and became a licensed personal trainer from ACE Fitness and a holistic health coach through the Institute for Integrative Nutrition; and through my budding yoga practice, I also became increasingly interested in meditation and participated in several mindfulness training programs through PTCI (Personal Transformation Courage Institute). My desire to share this knowledge and help others find peace in their bodies and minds through movement and nutrition led me to launch my practice, Get Lively: Mindful Health & Fitness Coaching. I work with clients one on one and in small group settings to support their health and fitness goals. And yes, I now proudly wear that gray Flashdance sweatshirt as my uniform.